This Research Guide provides information about anatomy and physiology resources found in the CCCC libraries and online. Supports BIO 165 and BIO 166. Why use a Research Guide? This guide is your secret weapon when it comes to research. It will walk you through each step of the research process and point out the best tools and resources the library has to help you along the way. Not sure where to find something? 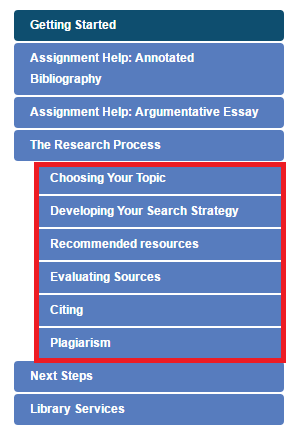 Search the LibGuides to find what you need right away! Look for the Assignment Help tabs in the menu on the left for help with your Research PaperLink will open in a new window. Links to outside resources that may help you even more! Every page has a few special boxes to guide you as you learn. Look for them as you go! Library Lingo: a brief definition of some of the terms you'll see in the guide. Tutorials: Each page in this guide includes at least one video or activity to help you see concepts from a different angle or practice them yourself. Help! At the bottom of each page is a box for help. The box includes a link to contact your librarian, and links out to resources or other campus departments that can help you learn even more. Don't Have Time to Follow the Guide? Use the Resources listed below to access the Library's Best Bets for finding sources in this class! Research on animal behavior, aquatic life and fisheries, biochemistry, ecology, plant science, toxicology, virology, microbiology, health and safety science, entomology, and more. Comprehensive resource containing citations (not full articles) to biomedical articles and life science journals. Check out other LibGuides like this one! An overview of Library resources related to the general study of Biology. A guide to library resources for nursing students.